Ah, the Christmas TV special: a wonderful time when our favourite television characters learn the true meaning of Christmas by a) doing a lazy remake of A Christmas Carol or b) starring in a ludicrously sentimental episode where all of their problems are solved by the magic of Christmas/Santa Claus/buying lots of presents/all of the above. Not all Christmas TV specials are terrible, though. In fact, some are so good that they can turn even the meanest of Scrooges into bona fide festive-jumper-wearing-Christmas-lovers. All of the specials in this list are almost guaranteed to be on at some point over the festive period (especially as 63% of this year’s Christmas telly will be repeats – they’ve even talked about it in parliament), so keep your eyes peeled (or, y’know, check a TV guide). Alan Partridge’s first (and only) Christmas special is nothing short of a hilarious disaster. Over the course of 46 glorious minutes, Norwich’s premier broadcaster brags about his new Rover Vitesse Fastback, attempts to pull the world’s largest cracker (with disastrous results) and punches his boss in the face with a turkey – all from the comfort of an accurate set recreation of his Norfolk home. Lovely stuff. In this classic Fresh Prince episode, Will Smith tries to show his cousin Ashley what a true Christmas looks like by decking their house in garish decorations. Naturally, this annoys the neighbours – including none other than heavyweight boxer Evander Holyfield. It has everything you could ask for from a Christmas special: chaos, celebrity cameos and just the right amount of heart-warming Christmas schmaltz. Christmas is lovely, but it can get a bit much sometimes, can’t it? That’s where South Park’s Woodland Critter Christmas comes in. It’s about as far from a traditional Christmas special as you can get; among other things, there’s a cult of Satanic animals, a devil baby and a ridiculous amount of violence. 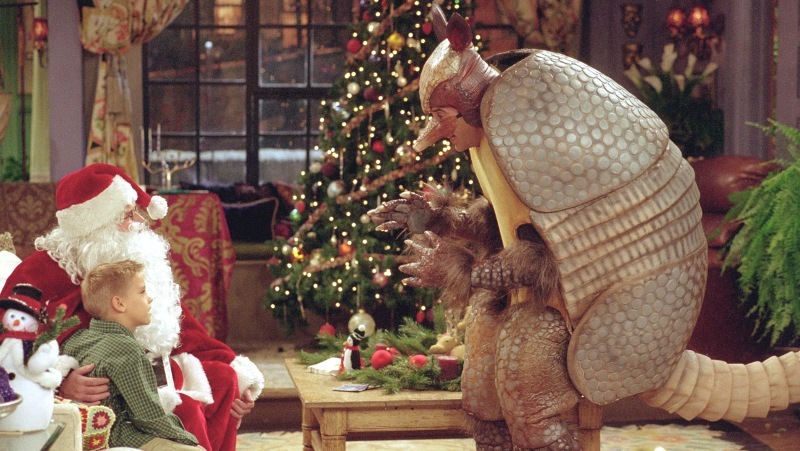 Not many shows can claim to have created their very own festive mascot, but that’s exactly what Friends did with the Holiday Armadillo. This episode perfectly demonstrates the lengths to which parents will go to impress their kids over Christmas; even if it means dressing up in the most ridiculous costume ever seen and inventing an entirely new festive myth on the fly. Christmas without Del Boy and Rodney is like a cracker without a joke; it’s nice (you still get a hat) but it’s not quite right. It’s hard to pick just one Only Fools Christmas special but we’re going to go with Heroes and Villains, in which Del Boy and Rodders become a real life version of Batman and Robin – but only after showing up at a wake in their extremely inappropriate costumes. It’s Only Fools at its finest; laugh-out-loud comedy without the slightly over-sentimental moments of later episodes. Oh, and here’s a fun fact for you: when it was first broadcast on Christmas Day 1996, 21.3 million people watched it! The Office’s 2-part Christmas special had everything: a rubbish office party, romance and David Brent. The first of the specials follows Brent as he pursues a dual life as a minor celebrity (which mainly involves appearing at depressing nightclubs) and a terrible salesman, while the romance of Tim and Dawn seems more doomed than ever as the ex-secretary now lives in America. Fortunately, things come together in the second part. Not only does Brent find love and a bit of redemption by telling his arch-tormentor Finchy where to get off (although he’s still annoying), but Tim and Dawn finally get together. It’s a perfect bit of Christmas storytelling. Oh no, we can feel the tears coming already. This sequel to The Snowman saw a young boy, whose dog recently passed away, make friends with the Snowman and his canine buddy, the Snowdog. They set off on an adventure to Snowmanland and take part in the Snowman Olympic Games (which is surprisingly competitive). Unfortunately, not even the magical Snowman and his dog can survive the effects of the sun. Bring hankies – you’re gonna need ‘em. Christmas can turn even the most cantankerous of grumps into a happy-go-lucky free spirit…unless that cantankerous grump happens to be an egomaniacal Irish priest. Rather than focusing on the magic of Christmas, A Christmassy Ted focuses on the horrors of Christmas shopping and the horrible effects pointless awards can have on people. Ted, Dougal and six other priests get lost in Ireland’s biggest lingerie department and, fearing a national scandal if they get caught, desperately try to escape. It’s not the most heart-warming of Christmas specials (Ted kind of resolves to be a better person at the end, but doesn’t really seem convinced), but it’s definitely one of the funniest. This Christmas edition of The Flintstones kicks off with Fred denying the existence of Santa Claus, which is fair enough because Christmas didn’t exist in prehistoric times. It’s amazing that he’s even heard of St. Nick. Of course, that doesn’t stop ol’ Beardy Chops from showing up at Chez Flintstone to drop off some presents. Unfortunately, he sprains his ankle and it’s up to Fred and Barney to deliver the world’s presents. It’s a race against time, though, because Fred is due at his work Christmas party and could get fired if he’s late (prehistoric employment laws were really, really harsh, apparently). Simpsons Roasting on an Open Fire is the very first episode of The Simpsons, setting the tone for what was to come over the next 20 years. It’s also a lovely Christmas special, with the family short of money over Christmas (partially due to Bart getting a tattoo) but finding something altogether more joyous: the love of a good pet. D’aww! What is your favourite Christmas special? Tell us in the comments. If you’ve got any TV boxsets you’d like to sell (or you receive any over Christmas! ), why not sell them with musicMagpie?